GS16S Atomizer is specially designed with no burning taste even at high wattage. It works perfectly in the range of 8 - 20W. GS16S is a perfect choice for your vapor life. Ego thread and 510 thread are both available. 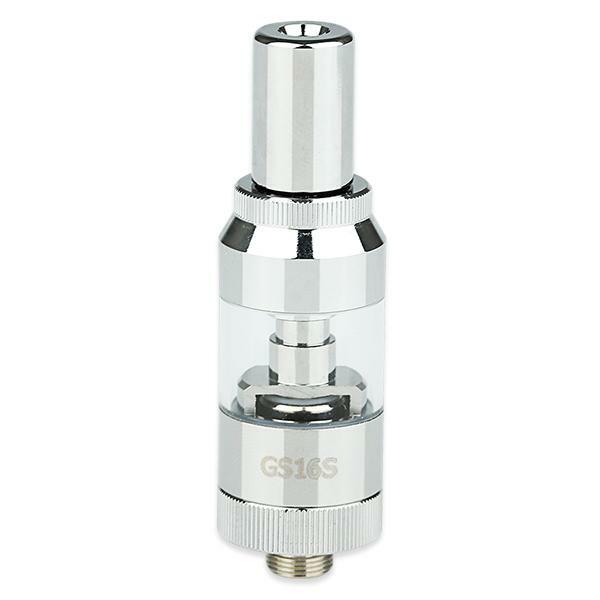 GS16S Tank by Eleaf features fashionable exterior, made of steel and Pyrex glass. Using the clipper-built and pluggable mouthpiece, it brings you a more comfortable vapor feeling. Additionally, BDC atomizer head delivers the functionality with product appearance. • With CE & ROHS certificate on the package box. • It comes with two types: eGo or 510 thread. • The replacement atomizer head is here. Eleaf GS16S BDC Atomizer is a 1ml atomizer with a 1.8ohm resistance. Made of pyrex glass and steel. Uses the clipper built and pluggable mouthpiece. BDC atomizer.